Hooking up the Hot Shot to your engine is very easy. Below are some options and guidelines. The first method (Direct) is the easiest, least-expensive, and the Hot Shot comes with everything you need. We are listing the others as an option for those customers who want to go that route. Screw the two supplied ¼” NPT male quick-disconnects directly into the drain plugs on each side of your engine block and you’re done. See Figure 1 below. If your block does not have drain plugs, simply drill & tap the aluminum freeze plugs (they are easily removed and replaced). Note: Depending on the size of the kickout on your oil pan and the location of the block drain plugs, you may have to remove the oil pan to insert the fitting on the right side of the engine block. Lines are run from the block to a bracket with our quick-disconnects. The advantage of this method is both couplings are located in the same spot for easier access. See Figure 2 below. We sell the bracket and all necessary plumbing as optional accessories on our Order Page. For more pictures and details on this connection method, view our Remote Hookup Instruction Sheet. Use a lower radiator hose check valve, which is readily available from most any speed shop, with our supplied quick-disconnects. We do not sell a lower radiator check valve at this time. If you already have a lower radiator valve with fittings, contact us before ordering and we can put the matching hose-ends on your heater for you! 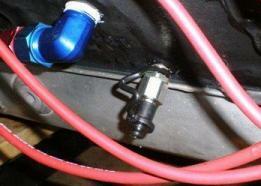 There are many ways you can plumb your engine for a heater. Above we have listed the most common methods, but as long as you are creating a loop in the cooling system (which includes the heater), you can plumb it any way you want. The key is to have the 2 hookups for the heater at opposing ends of the cooling system to create as complete a loop as possible. A nice method for SBC steel block engines is to use billet aluminum freeze plugs that press right in and replace the traditional tin/brass plugs. 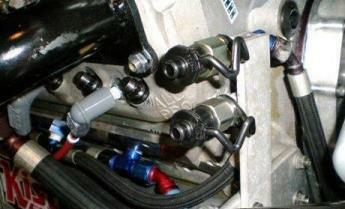 Speedway Motors sells a set already tapped ½” NPT and Joe’s Racing has them with an integral AN8 fitting. We have had customers put a “T” fitting on the lines into/out of the block or head with good success. Another good connection point is to use the two water ports on the front of the block. These are typically blocked off with aluminum plates. We’ve had customers drill & tap these plates ¼” NPT and then run lines to our remote bracket. Shoot us an email or give us a call and we can help you figure out the best way to plumb your engine. Regardless of the connection method, the entire engine and cooling system is heated completely and uniformly. This includes the water, heads, radiator, and block, etc. The Hot Shot does not create any additional cooling system pressure via the pump, it is only through the heating of the water that pressure is created (the same as what happens when running your engine). A cold engine with the Hot Shot running will have 0 psi cooling system pressure, at 180* there will be approximately 10-14 psi. In the video above, the gauge indicates 11 psi of pressure at the top of the radiator at 180*.